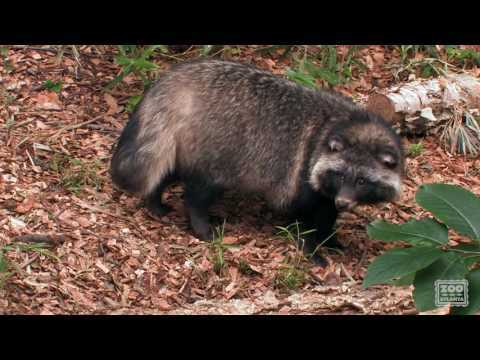 While sometimes called raccoon dogs because they are similar in appearance to raccoons, tanuki are, in fact, canids. They are more closely related to wolves, coyotes and domestic dogs than they are to raccoons. These are generalist omnivores and scavengers who tend to do well near human environments, much like raccoons and coyotes. While these animals chiefly are nocturnal, they do spend a good amount of time foraging around in daylight hours. Alternatively, they can be seen in a furry pile, napping together. They evolved in climates with warm summers and cool or cold winters, so can be seen year-round in Atlanta. 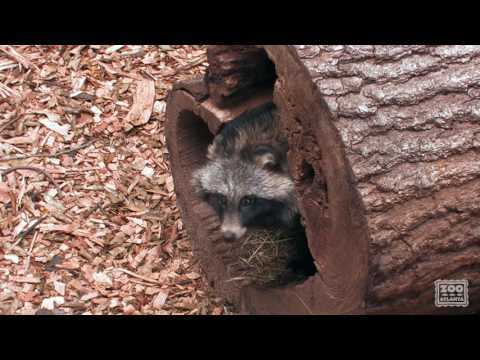 They have shelters such as hollow logs to stay warm or dry as needed. Tanuki enter a state of lethargy called torpor in the winter, and they are the only canids that do this. In preparation for torpor, their weight is almost doubled between June and October. Torpor is different from hibernation in that they will emerge to forage on warm winter days. 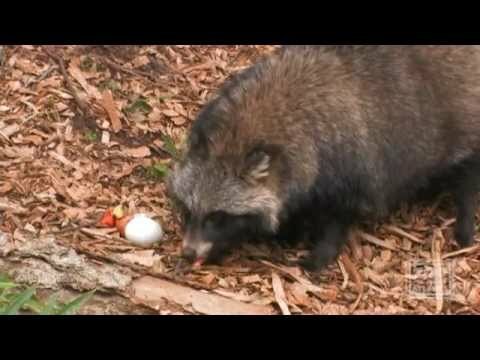 Raccoon dogs do not bark, but they do growl when threatened. Their vocalizations are higher in pitch than a domestic dog’s and sound more like a cat. Tanuki are good climbers and with the exception of foxes, are the only canids known to climb trees. They are also known to swim or dive underwater while foraging. In Japanese folklore, tanuki are portrayed as comical, mischievous shape-shifters who often deceive humans. Statues of tanuki are often found outside Japanese restaurants and bars to welcome guests and are often depicted as wearing straw hats and carrying a bottle of sake with a promissory note for a bill which they will never pay. Tanuki fur is yellow-grey to reddish-brown. The fur is thicker in autumn and winter. Their shoulders, tip of the tail, and legs are black. They have facial markings similar to a raccoon’s, including the characteristic black mask. Tanuki are 1.5 to 2 feet long, with a tail about a half-foot long. They weigh 8 to 22 pounds. Tanuki form monogamous, permanent pairs that share a home range, forage together, and care for offspring together. Pairs usually avoid other pairs, but resting and latrine sites are sometimes shared with related family members. Tanuki tend to flee from confrontation, sometimes “playing dead” to avoid predators. Tanuki reach sexual maturity at 9 to 11 months old. Mating typically occurs in the spring, and gestation lasts about nine weeks. The average litter size is six. Pups typically weigh between 100 and 120 grams, and both parents participate in their care. The young emerge from the den at 3 to 4 weeks old and are weaned at 4 to 5 weeks. The wild lifespan is 7 to 8 years but is generally longer in zoological settings. Tanuki are native to eastern Asia, including Japan, but have been introduced to and are now widespread in northern and eastern Europe. Deciduous forest, broad-leaf evergreen forest, mixed forest, farmland, and urban areas from coastal to subalpine zones. Tanuki are often found near water. In autumn, they are dependent on fruits and berries, which affects habitat selection. In the wild, these omnivores eat everything from invertebrates to vertebrates such as frogs, lizards, birds and rodents, as well as seeds, berries, fruit and carrion. In human-developed areas, they will forage for human garbage and roadkill. Those that live near the ocean will venture to the seashore to feed on crabs, other marine life, or carcasses brought in by the tides. At the Zoo, we offer a varied diet of fruits (apples, bananas, papaya and grapes); vegetables (carrot, sweet potato, corn, zucchini); hard-boiled eggs; capelin (a type of fish); dog food; and a commercial beef diet specifically for canids.